This year´s „gay pride“ parade was supposed to be the biggest one in the history of Turkey. Event organizers expected up to 100,000 visitors to make it the biggest LGBT parade that has ever taken place in a Muslim country. But it turned out differently. When on sunday afternoon first participants reached the central Taksim Square and the adjoining main pedestrian street Istiklal street, police had already been expecting them. They fired water cannons, rubber pellets and teargas to disperse the festival goers. The scene turned violent when some began chanting slogans against the islamic-conservative president Erdogan. Organizers of the march released a statement saying the Istanbul governorship was not allowing the procession, citing the Muslim holy month of Ramadan. While homosexuality is not a crime in Turkey as it is in most other Muslim countries homophobia remains widespread. The police forced thousands of parade participants to gather several blocks away where the crowd grew to several thousand people as the day wore on. 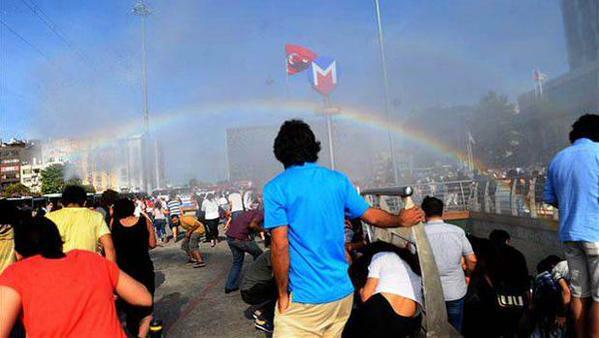 When policemen fired jets of water from trucks at the crowd, rainbows formed in the water cannon sprays.